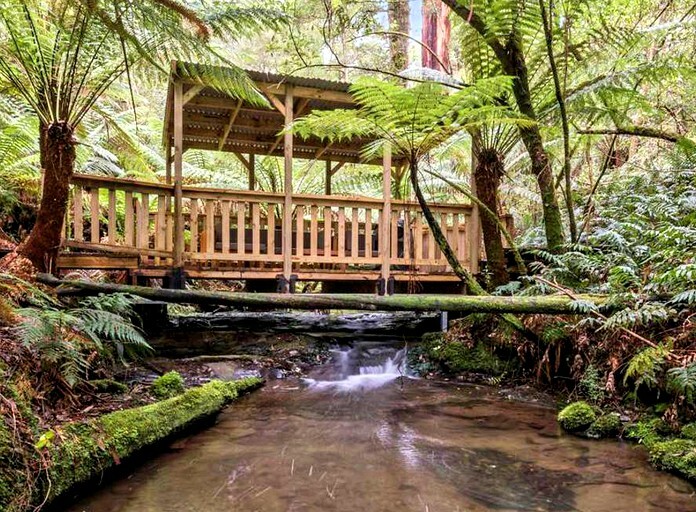 This romantic cottage rental is tucked away in the lush rainforest landscape of Australia near Apollo Bay, Victoria. With two beautiful bedrooms and one full bathroom, this cottage can accommodate up to four guests. The first bedroom has a queen-size bed, while the second bedroom has two single beds and a third trundle bed upon request. The bathroom offers a toilet, a spacious shower, and a vanity. Fresh linens, doonas, blankets, towels, toiletries, and a hairdryer are all kindly provided by the host. In the living room, glampers can relax on the fluffy sofa and cozy up together beside the wood-burning fireplace. The adjoining kitchen is equipped with a coffee machine, a tea kettle, a mini-oven, and all of the serving and cooking utensils guests might need. Glampers will be able to immerse themselves in the tranquility of nature while still enjoying access to a fantastic array of amenities and modern conveniences during their stay. The property features lush gardens, sheep paddocks, and over 100 acres of picturesque rainforest landscape to explore. Glampers can roast s'mores around the firepit or relax in the romantic pavilion, which is suspended over a creek and offers comfortable outdoor sofas. Inside the rental, glampers will find a cozy wood-burning fireplace, a selection of books and games, and complimentary Wi-Fi. Other amenities include air conditioning, a cot or pram upon request, and parking. This enchanting property is situated in the charming community of Tanybryn, Victoria. Glampers will be conveniently located along Skenes Creek Road, which connects Forrest, Colac, and the Great Ocean Road. The rural setting of this getaway offers plenty of privacy, making it the perfect choice for glampers seeking a peaceful retreat in the Australian countryside. The property is surrounded by miles of world-class walking tracks, timber boardwalks, bridges, and steps that meander through lush rainforest past 300-year-old mountain ash, magnificent myrtle beech, and ancient ferns. The tracks also lead to three private waterfalls situated on the property. Surrounded by Victoria's abundant natural wonders, glampers will have a multitude of options for outdoor activities to experience together. 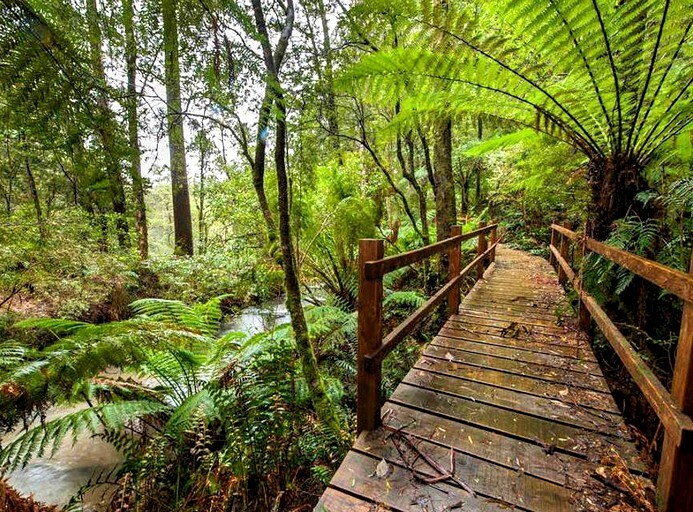 Glampers will find plenty of scenic nature trails for bushwalking, hiking, mountain biking, horseback riding, and wildlife viewing. There are three stunning waterfalls nearby, one of which features majestic glow worms in the evening. Glampers will be only 15 minutes from the ocean, where they can enjoy in activities such as boating, surfing, sunbathing, and romantic waterside beach picnics. There are also several lakes in the surrounding region that provide great conditions for canoeing, kayaking, boating, fishing, and swimming. For a break from the great outdoors, glampers can visit the charming neighboring town of Forrest and Apollo Bay. There, glampers will find options for shopping, dining, and entertainment. With close proximity to the rainforest, the water, and town, there is something close by for everyone to enjoy. Check-in is between 15:00 and 20:00. Fires are permitted only in the designated firepit which is not available during fire ban season. 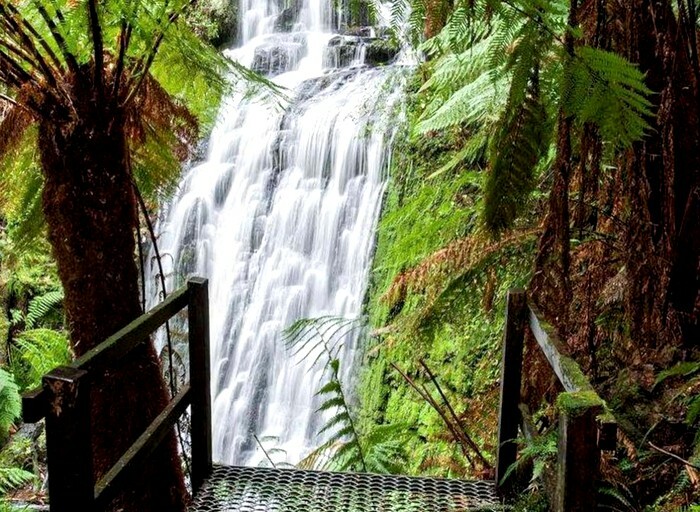 All children must be fully supervised, particularly on the rainforest and waterfall tracks.